Combining our own experience with European technology, Xinda Machinery manufactures environmentally friendly ready-mixed batching plants. Our products come with automatic twin-computer synchronization controlling systems that are capable of controlling and managing production flow with one or two computers. Our versatile products find wide application for pre-cast, pipes, components, dam construction and marine construction. By using twin-shaft compulsory mixer, it mixes evenly and rapidly, achieving good mixing effect for all kinds of dry concrete, semi-dry concrete and plastic concrete. Multi-angle stirring arm avoids the phenomenon of concrete holding shaft. When the mixer main engine works the mixing shaft counter rotates. The materials remain in boiling motion under the action of the mixing blade. Meanwhile, under the shearing action of the stirring arm, the material is fully mixed in a relatively short period of time. Mixing Blade----Both stirring arm and mixing blade are connected by bolts; it is convenient and quick for maintenance and replacement. The mixing blade can be easily adjusted in the stress and wear direction until it must be replaced. The blade is made of high-strength and impact resistance high-chromium wear-resistant alloy iron, with a normal life of more than 40,000 loads (cans). The performance index of the mixing blade meets the standard of JG/T5045.1-93, among which HRC>=58，impact value>=5.0N.m/mm2, bending strength 600N/mm2. The arc plate is made of high-chromium wear-resisting alloy iron. Its performance index meets the standard of JG/T5045.2-93, among which HRC>=54，impact value>=7.0N.m/mm2, bending strength >=600 N/mm2 with a life of more than 40,000 loads (cans) under normal use. Reducing System----The reducing system adopts the flywheel end synchronization and closed planetary deceleration mode. With a compact structure and high transmission efficiency, it is easy to maintain and has a long service life; it can satisfy different slump concrete mixing. Shaft-end Sealing Device----The shaft end supporting structure and sealing structure separate, so as to prevent damaging bearings in case the sealing device breaks down. The customer can optionally choose the advanced pneumatic sealing system. Lubricating System---- The lubricating system adopts the most advanced automatic-charging lubrication oil system. Different points where oil is needed are supplied with lubrication oil properly along the oil pipelines. The lubrication oil enters effectively into all lubricating points and seal cavity, playing a part in both lubricating and sealing. Discontinuous type of computer-controlled oiling ensures the minimum fuel consumption while the shaft end sealing runs reliably. The aggregate batcher can be designed to installation underground, partially underground or on the ground. The aggregate hopper can accommodate 3-5 hoppers. The hopper discharge gate speeds are pneumatically controlled by the computer to discharge the aggregate into the weighing hopper. The weighing of the aggregate can be done in separate or accumulative models according to the operational form. The aggregate conveyor belt system is truss-framed for easy assembly. The inclination angle is normally less than 20 degrees; however, if the chevron (groovy) pattern belt is used, the inclination angle can be up to 20 to 45 degrees. The belt tension device is a standard weight-drop type for easy adjustment. The conveyor belt system is completely sealed. Pump straight into weighing hopper or gravitationally feed into the weighing hopper through the upper storage tank. According to different circumstances, a three-point or single-point sensor suspension is adopted. The weighed admixture and water enter into the mixer according to the instructions. Powder is delivered to corresponding weighing hopper by screw conveyor or the pneumatic conveying. The number of weighing hoppers is decided as required, being generally one to three hoppers. After being weighed the powder is put into the mixer in accordance with the instruction. All powder sensors use three-point suspension. Dust collection system mainly aims at dealing with dust generated in the process of loading the mixer and pumping powder into the powder tank. 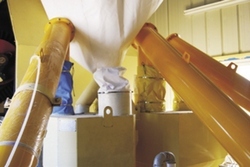 The dust generated while loading the mixer is collected through two main machine-centered methods of collection and is returned to the mixer; it can be reused. For the dust generated when pumping powder into the powder tank, it falls back to its corresponding powder tank through the dust-collecting mechanism on the silo roof. The ground-centered dust collecting machine will collect all kinds of powder. In this case, the mixed power is only appropriate for low grade concrete reuse. The control system uses domestic advanced double machine synchronized control and is equipped with specialized UPS power supply, high performance long-life Siemens PLC, high speed and high precision weighing unit module, the international famous low-voltage electrical component, and is combined with our professional control and monitoring software. In the concrete mixing equipment industry our company creatively adopts the high performance PLC+IPC (Industrial Personal Computer) control system which achieves the most reliable operation, the lowest failure rate, the easiest failure processing, and the lowest requirement for the capacity of the maintenance personnel. All these concur towards our company’s quality request – the best service is no maintenance. The system carries out full automatic production process of material measurement, transfer, mixing and discharge in the mixing plant. It has real-time data processing function and intelligent alarm function. The system can be automatic, semi-automatic control, or manual operation. It is easy and convenient for operation. We can provide special design for the special requirements of our customers. The computer control interface analog displays the whole dynamic process of the mixing plant, which is clear and plainly visualized. It can store all types of matching and working data of the mixing plant and print various kinds of report data and forms; In short, it can satisfy the need of industries such as commercial concrete, high-speed rail, pavement concrete, etc. The container-type control room uses sound insulation and heat insulation sandwich boards, being spacious and bright, with a beautiful appearance. It not only ensures the proper working environment temperature of the electrical components, but also improves the operator’s comfort. Optional selection of remote diagnosis service system or local area network management system.